In the 1860s, German-born and New England bred Albert Bierstadt catapulted to fame and fortune as the painter-poet who defined the image of the American West. Bierstadt’s big pictures of spectacular western scenery offered a vision of a bright and expansive future to a public weary of the stress of war and destruction. Through the 1860s and early 1870s Bierstadt rode a wave of critical, professional, and popular acclaim. In 1865 he built “Malkasten,” his dazzling home and studio on a height overlooking the Hudson River in Irvington, New York. In 1866, he married the beautiful Rosalie Osborne Ludlow. In 1867, in the course of a two-year honeymoon trip to Europe, he was presented to Queen Victoria and was made a member of the French Legion of Honor by Napoleon III. In 1875, his work, The Discovery of the Hudson, was placed in the United States Capitol. In 1876, he was a guest of President Rutherford B. Hayes in the White House. But the decade of the 1870s marked the beginning of a steadily declining slope of his career. Looking for smaller, more intimate pictures, objects for quiet and private contemplation, the art public turned away from Bierstadt’s theatrical vision. Rosalie Bierstadt’s health failed, necessitating a series of visits to the Bahamas. In 1882 Bierstadt’s beloved home, “Malkasten,” burned, with a significant loss of the works in his studio. By 1889 Bierstadt was denied a place on the walls of the American section of the Paris International Exposition. In 1893, Rosalie Bierstadt died. Although the artist married a wealthy widow in 1894, he declared personal bankruptcy in 1895. By the time Albert Bierstadt died in New York City in 1902, he was remembered, if at all, as an artifact, a throwback to a time when Americans had flocked to see monumental landscape pictures crammed with photographic detail and punctuated by boldly dramatic lighting effects. Albert Bierstadt was born in Solingen, Prussia, and raised in New Bedford, Massachusetts, to which his father, a skilled cooper, had emigrated with the family when Albert was two years old. There was constant need for Henry Bierstadt’s barrels in the busy New England whaling port, and Bierstadt enjoyed a pleasant, if unremarkable, childhood. He determined, early on, to be an artist. By 1850 he felt confident enough in his skills to advertise himself as a teacher of drawing. He first exhibited his work in 1851 in a New Bedford shop. In the same year he showed with the New England Art Union in Boston. By 1853, when he exhibited at the Massachusetts Academy of Fine Arts, he already had his sights set on European training. There was no question but that Bierstadt would go to Düsseldorf. Emanuel Leutze, like Bierstadt a German-born American painter, had been there since 1841. In 1849, the Düsseldorf Gallery had opened in New York City, exciting the imagination of Americans and directing the attention of aspiring American artists to the impressive strength of Düsseldorf, both as the home of a technically accomplished style of painting and as a formal Academy. By 1853, when Albert Bierstadt left for the Rhine city, planning to study with Johann Peter Hasenclever, a cousin on his mother’s side, he followed in the footsteps not only of Leutze, but also of American artists Richard Caton Woodville (1845), Eastman Johnson (1849), Worthington Whittredge (1849), James McDougal Hart (1850), and Charles Wimar (1851). While he was there, he was joined by William Stanley Haseltine (1854) and George Caleb Bingham (1856). Bierstadt arrived in Düsseldorf only to learn of Hasenclever’s recent death. Undaunted, the young American sought out two compatriots, Leutze and Worthington Whittredge, and was offered a corner of Whittredge’s studio for a work space. Bierstadt never studied formally at the Academy, but continued as he had begun, essentially self-taught, utilizing a system of mentors who included his American friends as well as important German artists he met through the convivial social milieu of the artists’ society, the “Malkasten” (“Paint Box”). The Malkasten was a gathering place for artists committed to currents of change, including political liberalism as well as freedom from artistic restrictions. It was a focal point especially for landscapists and artists committed to the developing trends of naturalism and realism. Before Bierstadt ever saw Yosemite, then, his eye was inspired and his brush trained by the beauty and majesty of the hills and valleys of Westphalia, Germany. Bierstadt sent works home to New Bedford in the spring and summer of 1855, which were displayed in New Bedford shops. These were so accomplished that a disbelieving journalist suggested in print that they were not the work of the home-town boy and self-taught artist. Bierstadt returned from Europe to New Bedford in September 1857. 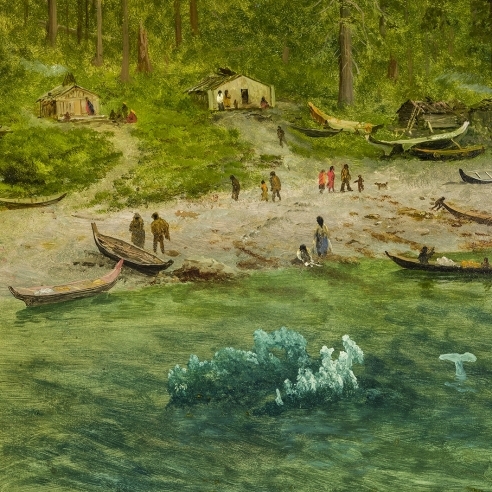 In April 1858 he burst upon the center of the American art world at the prestigious National Academy of Design in New York City with his Lake Lucerne, Switzerland (National Gallery of Art, Washington, D.C.), a six-by-ten foot rendering of the European romantic sublime set in its defining location, the Swiss Alps. The pattern set early endured. Bierstadt’s later work as the iconic artist of the American West was a brilliant adaptation of this essentially European style to the specific scenery and ideological requirement of an America poised on the brink of Manifest Destiny. Lake Lucerne brought the young artist critical and professional acclaim. Flush with that success, Bierstadt began making plans to travel west and found a way the following year. The Crayon of January 1859 informed its readers that “in a short time, Mr. Bierstadt starts for the Rocky Mountains, where he intends to remain a couple of years, making sketches of the scenery, and studying the manners and customs of the Indians, preparatory to painting a series of large pictures." In April 1859, Bierstadt joined Col. Frederick W. Lander’s overland trail survey team. 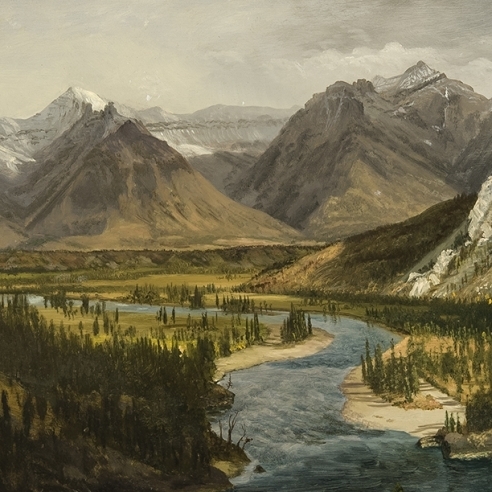 It was the first of more than eleven trips that Bierstadt made during the course of his career to the American West, the Canadian Rockies, and Alaska. While Lander went all the way to California, Bierstadt continued only as far as the South Pass on the Continental Divide, in the southwest quadrant of the current state of Wyoming, sketching the Wasatch Mountains of Utah, and the Black Hills and Wind River in Wyoming. By September 1859 he was back in New Bedford, full of stories to tell and sketches to turn into studio pictures. While Bierstadt remained personally and professionally close to his family all his life, and particularly to his brothers, Charles and Edward, who set up together as stereographic landscape photographers, New Bedford could not begin to accommodate his ambition. With the sketches, Indian artifacts, and Western paraphernalia acquired on his trip Bierstadt moved to New York City in 1860 and rented a studio in the recently opened Tenth Street Studio Building, acquiring as a neighbor his role model, the pre-eminent American landscape artist Frederic Edwin Church. Here Bierstadt painted Base of the Rocky Mountains, Laramie Peak (unlocated), which created a sensation when it was exhibited in April 1860 at the National Academy of Design. One month later, in May 1860, Bierstadt gained election as a full Academician. His appetite for western scenery only whetted by his first trip, Bierstadt looked in vain, in 1860 and ‘61, during the dark early days of the Civil War, for another opportunity to travel West. Instead he remained in New York, venturing to New England to paint and sketch. In March 1862, Frederick W. Lander died of wounds incurred in combat for the Union cause. In December 1862, Goupils Gallery exhibited the large-size California photographs of Carleton Watkins, which Bierstadt saw and which undoubtedly underlined his urge to reach California. In 1863, he finally set off with Fitz Hugh Ludlow, a New York literary figure who had an assignment to write and publish an on-the-spot travel diary. Bierstadt and Ludlow followed the overland route of the Oregon trail on its southern path. Before Bierstadt left, however, he exhibited to great acclaim a major new western picture, The Rocky Mountains, Lander’s Peak (The Metropolitan Museum of Art, New York), in tribute to the fallen Union hero. He showed the picture at the Century Club, at the Tenth Street Studio Building, and in Boston, where he charged a twenty-five cent admission fee. The picture traveled to Europe, where it was shown with the American works at the Paris Universal Exposition in 1867. Everywhere it went it attracted favorable reviews, establishing a European reputation for Bierstadt that became an important source of later patronage. Ludlow and Bierstadt arrived in San Francisco in July 1863. From there they went, via the Mariposa Grove of giant sequoia trees, to Yosemite, where they spent seven weeks camping, sketching, and writing. They returned to rest in San Francisco, and then proceeded north to the Oregon territory, venturing as far as the Columbia River, before Ludlow fell ill. Although they had planned to go as far as Canada, they booked passage on a boat in Portland, travelling down the Pacific coast to Panama, through the Isthmus, and again by boat up the Atlantic Coast, where they arrived in New York City by December 1863. Bierstadt continued to promote his western pictures aided by Ludlow’s chronicle of their trip. At the Metropolitan Fair for the U.S. Sanitary Commission held in New York in April 1864, a fund-raising effort to provide medical relief for Union soldiers, Bierstadt’s The Rocky Mountains, Lander’s Peak hung opposite Frederic Church’s Heart of the Andes (1859, The Metropolitan Museum of Art, New York). Bierstadt himself participated in the Fair, running the “Indian Department” and presiding over his own Indian artifacts (which normally decorated his Tenth Street studio) as well as live “performances” by Indians. By now Bierstadt was firmly established as the painter of the American West. In the years that followed Bierstadt continued to paint and exhibit western subjects. In 1865 he sold The Rocky Mountains, Lander’s Peak to an English railroad magnate for the astounding sum of $25,000. A highlight of Bierstadt’s two-year European honeymoon came at Christmastime 1867 when the artist was invited to show The Rocky Mountains, Lander’s Peak and Storm in the Rocky Mountains, Mount Rosalie (The Brooklyn Museum, New York) to Queen Victoria and the Royal Family. In 1871, the Bierstadts traveled to San Francisco, a trip much facilitated by the recently completed (in 1869) transcontinental railroad. They remained in California until 1873. During that time Bierstadt accompanied Collis P. Huntington, the railroad baron, to the Donner Pass, where Huntington personally selected for the artist the vantage point he wished for a commission showing the site of the Donner Tunnel, one of the most difficult engineering feats on his railway line. On this trip, Bierstadt sketched winter scenes in Yosemite, traveled to the Sierra Nevada, and went with photographer Clarence King to the South Sierra. In 1876–77 Bierstadt returned to Colorado with an important patron, the Earl of Dunraven, to sketch for a commissioned work. He returned to the West in 1880 and 1881. His last trip West was to Alaska and the Northwest Coast in 1889.